VANCOUVER — The other athletes sat in front of signs that showed where they were going to compete in college. Lincoln Victor’s sign was folded up and out of sight, though. Close, close friends and family knew. Victor, though, wanted to add a little drama to the Signing Day ceremony at Union High School. 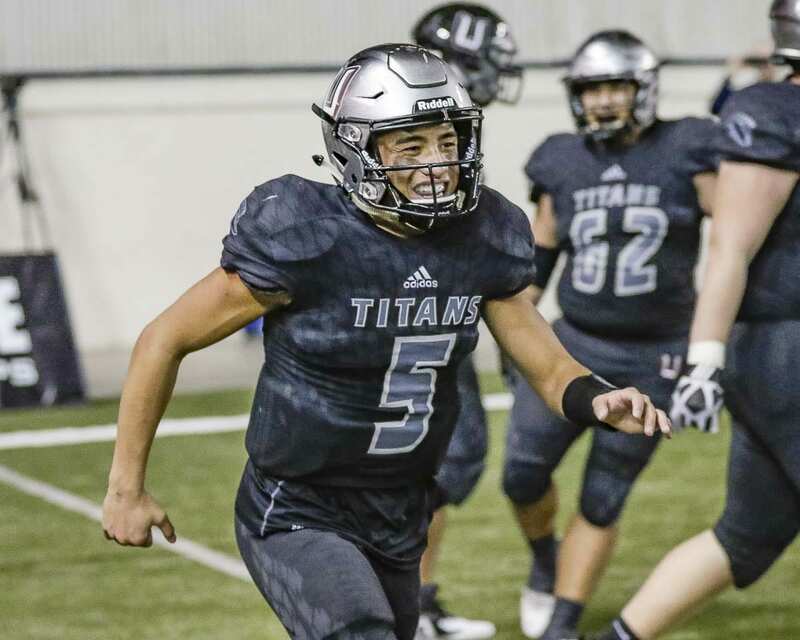 Victor, the state high school football Player of the Year who helped Union to a Class 4A state championship in the fall, announced on Wednesday that he had signed with the University of Hawaii. A quarterback in high school, he will be a slot receiver and special teams player for Hawaii. And if he is asked, he would play defense, too. Victor revealed the biggest news of the day in Clark County. After all, the other signees had already announced their decisions. At Union, the state champions honored six football players. At Union, Jojo Siofele, who had the best performance of his amazing varsity career in the state championship game, signed with Portland State. Alishawuan Taylor, a receiver/defensive end/linebacker will likely focus on defense at Northern Arizona University. James Durr, a long snapper specialist, is going to Eastern Washington. The Titans also celebrated Darien Chase (Nebraska) and Dumitru Salagor (Montana), who signed in the early football period back in December. “It’s not overwhelming anymore,” Victor said, referring to the recruiting process that is now concluded. Eastern Washington was Victor’s other finalist. But Victor was impressed by Hawaii during the official visit, plus he wants to major in a program the university is known for, kinesiology. While playing time was not promised, Victor was assured that he would get an opportunity to play right away. Hawaii opens up the 2019 season with three games against Pac-12 competition, including a road game at Washington. “Hopefully I’ll be playing in the best stadium in the Pac-12,” he said of Husky Stadium. Victor had two trips to Hawaii this winter. One was when he played in the Polynesian Bowl, and the other was his visit to campus. “I will have a chance to showcase my talent,” Siofele said. He toured the school and facilities. Taylor recently committed to Northern Arizona because it reminded him of Union. Durr snaps pretty much every day, trying to perfect his specialty. He is going to Eastern Washington with preferred walk-on status, with a chance to earn a scholarship. Eastern Washington’s long snapper was a senior this past season, giving Durr an opportunity right away. Kobe Anderson of Mountain View is going to Central Washington University. Makai Anderson of Mountain View is going to Central Washington. Tyler DeJong of Skyview is going to Central Washington. Kanen Eaton of Columbia River is going to Utah State. Tyler Flanagan of Woodland is going to Central Washington. Brock Harrison of Ridgefield is going to Eastern Washington University. Monyell Hedgmon of Columbia River is going to Shasta College. Thai Hindman of Mountain View is going to Central Washington. Dawson Ingram of Camas is going to Eastern Washington University. Shane Jamison of Camas is going to the University of San Diego. Thomas Karcher of Columbia River is going to Linfield College. Dawson Lieurance of Columbia River is going to Linfield. Aidan Mallory of Hockinson is going to Southwest Minnesota State. Riley O’Rourke of Skyview is going to Central Washington. Brycen Priddy of Columbia River is going to Shasta. Makani Schultz of Ridgefield is going to Eastern Oregon University. Luc Sturbelle of Camas is expected to go to the Air Force Academy. Tyrehl Vaivao of Columbia River is going to Mt. San Antonio College. Note: Coaches and athletic directors can contact Paul Valencia at paul.v@clarkcountytoday.com to add to the list.